Eurostar is treating Business Premier customers to an exciting new destination – the London cocktail bar. 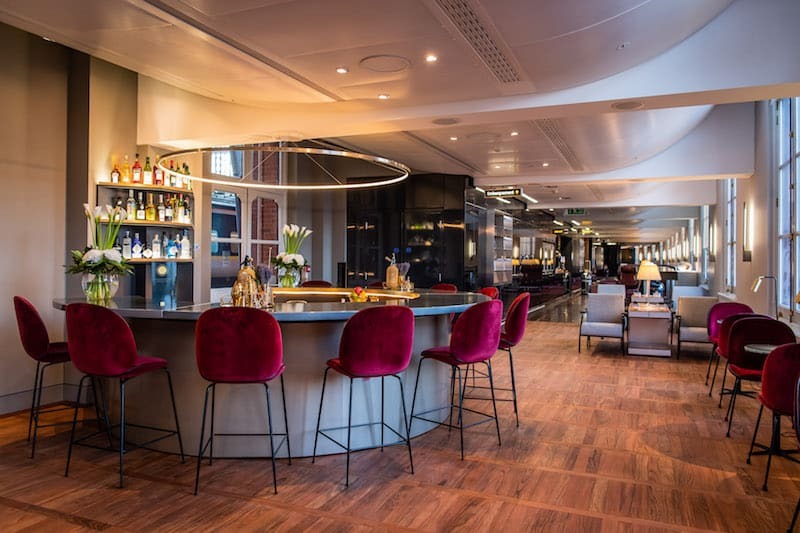 Located upstairs in the London lounge, the circular black and gold bar provides an atmospheric space for travelers to sample a selection of complimentary cocktails designed exclusively by the London Cocktail Club. Featuring a range of Dutch, French, Belgian and British spirits and ingredients, the drinks encapsulate Eurostar’s heritage, reminiscent of all four cultures in which it operates. From tipples titled Earl’s Elixirto Bourbon Boisé, the drinks are sure to suit tastes on either side of the Channel. Signature London cocktail: Michelin star chef and Eurostar Business Premier Culinary Director, Raymond Blanc OBE, has also designed a bespoke cocktail exclusively for the lounge in partnership with the London Cocktail Club. Named Lavender Dusk, the signature cocktail is a distinctive mêlée of delicate florals, punchy fruit flavors and piquant undertones. Mixed using Eurostar’s very own gin, Toujours 21, it is a delightful fusion of French botanicals and honey from the Kent countryside. For the first time, Eurostar is introducing a winter G&T menu, featuring gins from Amsterdam, Brussels, Paris, and London. Each exotic gin is perfectly paired with local tonic to offer passengers a twist on the classic. Raymond Blanc serves up new healthy salads for Eurostar Business Premier travellers Hong Kong Airlines Launch Super Diamond Business Class Seat On Newly Delivered A350 Eurostar offers lower fares from £25 each way Eurostar celebrates 10 years at St Pancras International Sheraton Grand London Park Lane has launched London’s first Five Senses Suite.